Go for the Fossils. Stay for the Scenery. Of all the places we’ve visited in our more than two years of continuous travel, Arizona’s Petrified Forest National Park has to be the most under-sold. We arrived there expecting to see 225 million year old wood. What we found were some of the most magnificent badland vistas of our trip. That’s not to say Petrified Forest doesn’t live up to its namesake, too. It does. 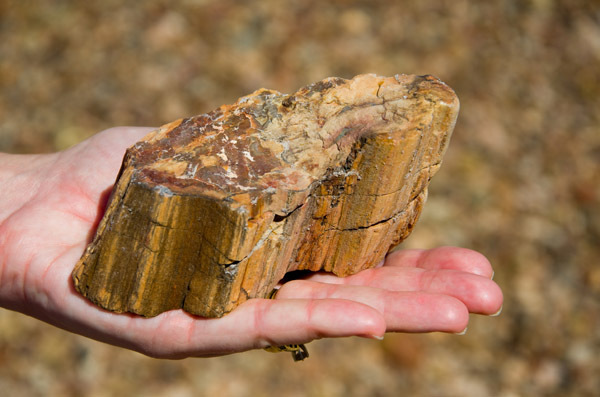 The place is lousy with fossilized trees. And unlike other fossils, these aren’t impressions of once living creatures in stone. These once living organisms are stone. Long ago, buried beneath a layer of ash, the cells of these felled trees gradually filled with dissolved silica. Over time those minerals solidified into quartz crystal, creating rock in place of the tree. Traces of iron oxide and other substances give these fossils remarkable colors that the plants never knew in life. It’s truly amazing and beautiful stuff. But what we enjoyed most about Petrified Forest is its surrounding badlands (not to mention a solar eclipse ordered up just for our visit). While not as large as Badlands National Park in South Dakota, we found incredible diversity in this bite-sized park. Our favorite area is reached by a single mile loop trail. The climb down into the Blue Mesa valley is a little steep but well worth the effort. 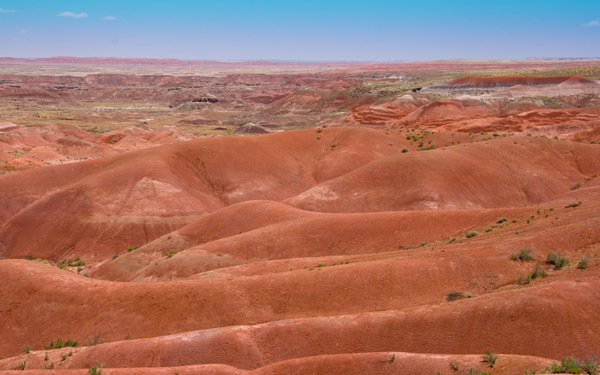 A short drive away, the blue bentonite clay hills disappear into the rolling red velvet carpet of the Painted Desert. 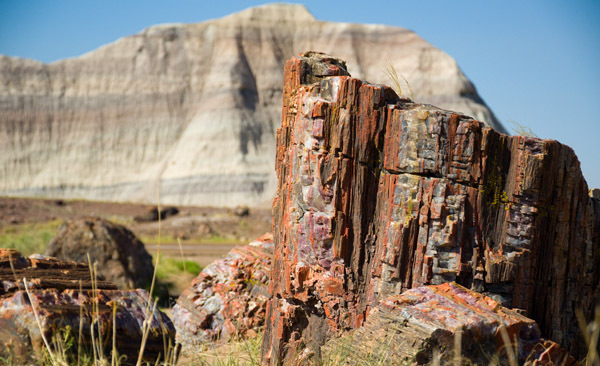 Within a four-hour drive from Grand Canyon, Petrified Forest gets a mere one-seventh of the visitors of its better known sibling. Maybe if they changed the name to something equally fitting, like Rainbow Vistas National Park, it would draw more interest. While we’re happy to have wonderful places like this mostly to ourselves, folks who venture all the way out here to see the Canyon should schedule some time to see this very special park as well. 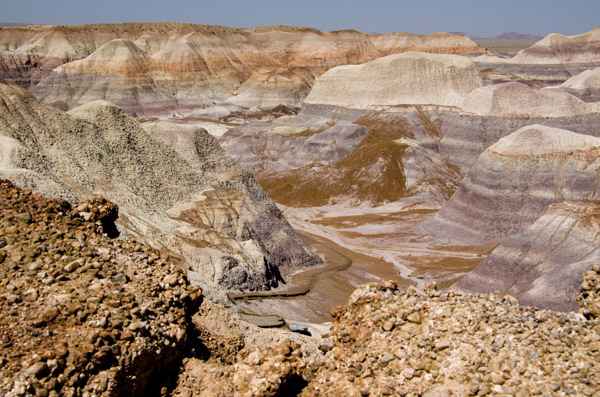 As many times as Al and I drive back and forth to Phoenix, we have yet to stop at the Petrified Forest NP. Thanks for the post, I think we’ll make it a priority this winter. It’s a super easy stop off of I-40. You can get off the highway at the north end of the park, do a short loop and pick up I-40 again in Holbrook a couple of hours later. Thanks for sharing one of our favorite NPs, though our visit was several years ago. It’s now been added to the list of places to be re-visited on our fall return from UT/NM. It’s definitely a place we’ll return to. Some places get overlooked because they’re out of the way (like Theodore Roosevelt in ND). But it’s not that far from Phoenix or Grand Canyon. I think this place just has an unfortunate name. “Petrified Forest National Park” sounds more like somewhere you’d go on a school field trip than a great vacation destination. Very interesting. I can’t believe I haven’t heard of this place before. Great photos! It really is amazing how many great places their are right in our back yard. I’m loving the opportunity we have to seek them out. Thanks for liking my “Wagon Wheel” post. Also means I get to learn about your journey! Hope all is well! One of our favorites too. Great post and photos! We LOVED this park! I particularly enjoyed the notes in the visitor’s center sharing the bad luck they had when they took a piece of a petrified wood home with them. Very interesting, old letters. This is such a beautiful place. Be well and safe travels. I love this idea for a blog!!! My husband and I LOVE traveling as well, and would love to do it for a living. It’s so exciting and encouraging to know that you figured out a way to do it. I can’t wait to read more about your adventures. Thanks for stopping by and for your comments. Check out our “How to Section” for our ideas on how to pursue your own dreams. Good luck and happy travels! I never would have thought to visit this place but it’s hauntingfly beautiful. Sounds like you had a wonderful time!